A painter of historical and mythological subjects, Gustave Boulanger worked in the neoclassical and orientalist styles. He studied in Paris with Pierre Jules Jollivet (1794-1871) and Paul Delaroche (1797-1856) in whose atelier he encountered, among others, Jean-Léon Gérôme (1824-1904). Boulanger traveled to Algeria in 1845, where he stayed eight months and executed numerous landscapes and studies of the local population. He entered the École des Beaux-arts, Paris in 1846, and won the Prix de Rome in 1849 with his painting Ulysses Recognized by His Nurse Eurycleia. He exhibited regularly at the Salon from 1848 to 1875, and taught at the École des Beaux-Arts and the Académie Julian. Our drawing is a study for a figure in his painting The Via Appia, at the Time of Augustus, exhibited at the Salon of 1874 (No. 235), now lost but known through an engraving (fig. 1). Rendered in red chalk on a buff paper, our drawing was obviously done in situ while Boulanger was travelling. Located in front of a sparsely indicated stone wall, the woman leans on a walking stick. Boulanger has underscored the subject’s facial features and the drapery of her robes with a blend of applied and stumped chalks. The skin of her face and arms are lightly drawn. In contrast to these details is the white scarf that encircles the woman’s head, wraps under her chin and is draped over one shoulder. 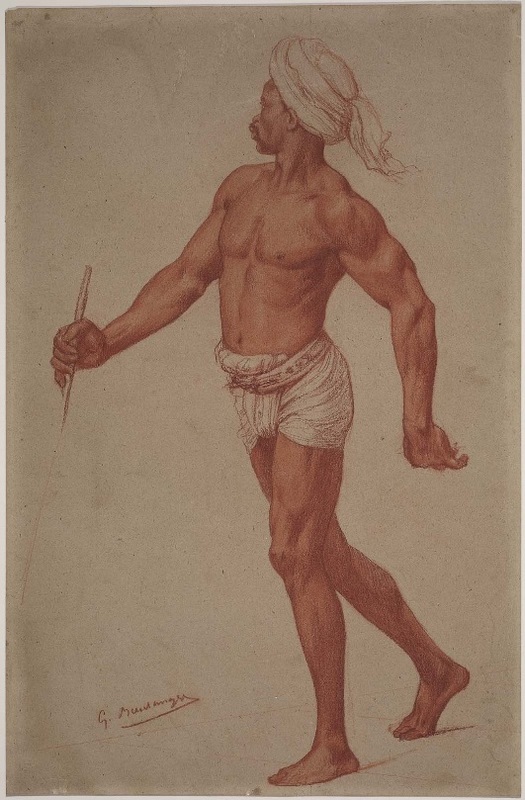 Boulanger’s works are included in the collections of the Museum of Fine Arts, Boston, which owns another red chalk study for The Via Appia, at the Time of Augustus (fig. 2); the Musée d’Orsay, Paris; the Hermitage, Saint Petersburg; the van Gogh Museum, Amsterdam; and the Art Institute of Chicago. Fig. 2 – Gustave Boulanger, Study of a Man in Turban and Loincloth, Museum of Fine Arts, Boston.